Have you always dreamed of being a hero, of waging a grand battle of Good vs. Evil, of saving the world? Maybe you thrill at the thought of diving headfirst into the action, ignoring the danger to save the ones you love. Maybe you’ve always known, in your heart of hearts, that you’re The Chosen One, meant to bring about a new era of peace and harmony. Maybe you had a suspicion that you weren’t living with the right family, that you were meant for greater things, that you had a grand destiny to fulfill. No? You’ve never had those thoughts? In that case, you’re probably not Harry Potter. But maybe you’re Ron Weasley, his best friend! Ron is pretty cool too, even if he doesn’t have a multi-million dollar film franchise named after him. He’s got his own neat talents though, like… he’s really good at chess. We mean, seriously, impressively good. And even though he’s sort of a third wheel to Harry and Hermoine, he’s the one who ends up with Hermoine in the end, giving hope to friend-zoned third wheels everywhere. Plus, he still manages to win all sorts of awards and honors during his time at Hogwarts, even without being The Chosen One. 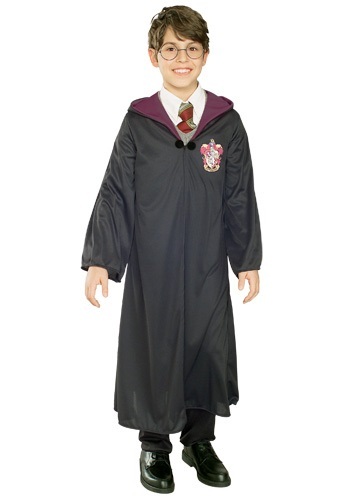 Now you can know what it’s like to be always be in the shadow of greatness without getting half the recognition you deserve, thanks to this Ron Weasley Robe. The long black robe has a black snap clasp and a maroon-lined hood. You’ll be ready for wizarding class in no time! Cute costume. Only problem was that the clasp connecting the robe in front broke right away. Luckily we had a safety pin on hand.